Woodlane Cottages is centrally located to the many cellar doors, restaurants, cafes, attractions and concert venues in the Hunter Valley. 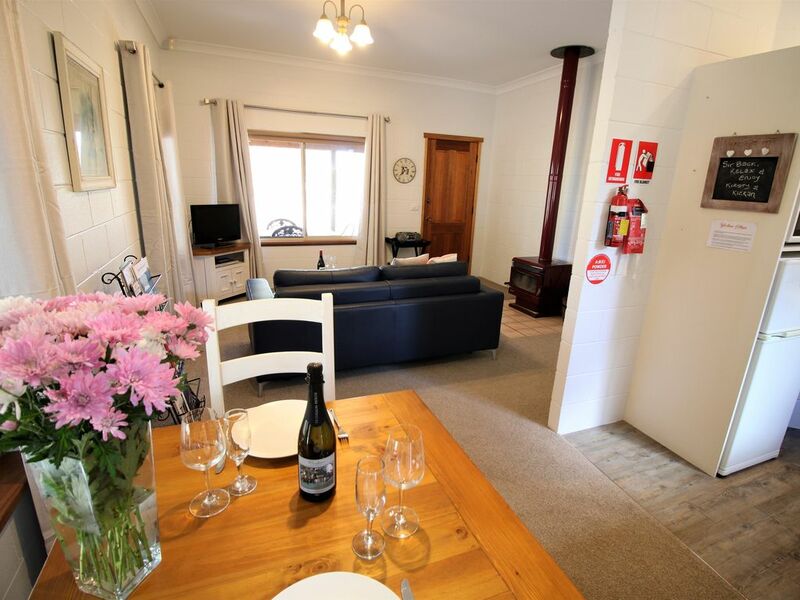 It's the place to book if you love the peace and quiet of country living and being surrounded by Australian bush. We back on to the Werakata National Park plus our property has 24 acres of wooded and open grassed areas to roam around. Perfect for bush walking, mountain bike riding and exploring. We have a 12 metre resort style salt water swimming pool to enjoy in the warmer months and for the cooler months the villa has a combustion wood fire in the lounge room to sit by, enjoy and keep fabulously cosy. We constantly hear "2 days just wasn't enough" so if time allows stay longer! We receive wonderful feedback from our guests, recent reviews are posted on our website and Trip Advisor. Private verandah equipped with a 4 burner gas BBQ, outdoor dining setting plus 2 x wooden recliner chairs to sit, relax & enjoy the views of the property and the Broken Back Ranges. All you need to bring along is your food, drink and beach towels for the swimming pool. We also have 2 x 4 bedroom cottages (Kookaburra & Currawong), each of these sleep up to 11 guests, with a maximum of 9 adults. Please enquire via our other Homeaway listings or via our Woodlane Cottages web page directly for these cottages or to enquire about booking multiple cottages and villas for a group booking. YOU CAN BOOK THE WHOLE PROPERTY WITH EXCLUSIVE USE OF WOODLANE FOR UP TO 26 GUESTS (Advance bookings are highly recommended for the whole property). Both cottages and villas are only a very short stroll from each other, but each cottage and villa retains privacy with how they are all set out on the property. Sorry but we do not permit pets as we live in a sensitive environment with lots of little woodland friends who also call this home. We had a wonderful stay at this property and would love to return again sometime. Our group of 16 were all very impressed with the standard of accommodation. Cottages and Villas were very well appointed, clean and comfortable and suited our group reunion well. Great location and lovely cottage! Currawong was a great cottage for 12 of us (6 adults and 6 kids) - close to the wineries and the hunter valley gardens. The cottage was well equipped, clean and homely. The onsite pool was a bonus. Would recommend especially for a larger group. We enjoyed our stay. Sue and Trevor were welcoming and the place is well-kept and welcoming. We look forward to welcoming you to share our hidden piece of paradise in the Hunter Valley.